A moment of distraction, a right hook, and you’re having a rendezvous with the ground. We’re not talking about boxing but a simple commute to work on a bicycle. The so-called ‘right hook’ is one of the most insidious things that a cyclist on the road can encounter. Yet it’s still a widespread phenomenon. What is it exactly, when it threatens you the most, and how to prevent it? We went to Robert Šťastný, the expert of ŠKODA AUTO’s Safety Research Department, to get some advice. It might not seem like a widely-recognized term but in some countries, it’s one of the most common reasons for a collision between a car and a cyclist. The situation is as follows – the cyclist, riding on a bike lane or the side of the road, gets overtaken from the left-hand side by a car intending to make a right turn. Inevitably, the car crosses the bicycle’s path. If the cyclist has enough time to hit the brakes, the result would probably be an exchange of a few angry gestures. But if the driver suddenly swerves right in front of the cyclist’s wheel (therefore, giving them the right hook), the cyclist will unavoidably end up in the car’s side. With or without a helmet, this is not something you would wish for. From the cyclist’s point of view, it’s a clear stab in the back. The driver either doesn’t see the rider at all or makes a bad estimate of the travelling speed and thinks, for some reason, that they can make the turn before crossing the bicycle’s path. Whether the cause is an oversight or a bad calculation, the cyclist either ends up with their head through the car door or somersaulting over the bonnet. Both scenarios are probably not going to end well for them. How to prevent this? Even though someone might object that the entire share of guilt falls on the driver and the cyclist is reduced to the passive victim role, in reality, both parties can work towards preventing such an accident. The moment the driver overtakes the cyclist and flashes the right turn blinker, the cyclist can diverge from the bike lane onto the road and line up behind the car. As soon as the car makes the turn, the cyclist can go around it on the outside or let themselves be undertaken by the car. One could say that the car and the bike switch lanes for a moment – the vehicle drives over to the bike lane or roadside and the cyclist enters the road. Of course, the situation requires the cyclist to make a quick look back to see if there isn’t another car following the turning one and they’re not crossing its path. Naturally, the exchange works best if both the cyclist and the driver are aware of each other and communicate via a language decipherable by all traffic participants. The cyclist turns to the incoming driver, signals with their left arm that they intend to exit the bike lane and move onto the road and the driver takes them over with the turn indicator flashing – to get in front of the cyclist on the bike lane in order to complete the right turn without jeopardizing the cyclist. The other variant is even simpler for the cyclist but requires more patience on the driver’s part. 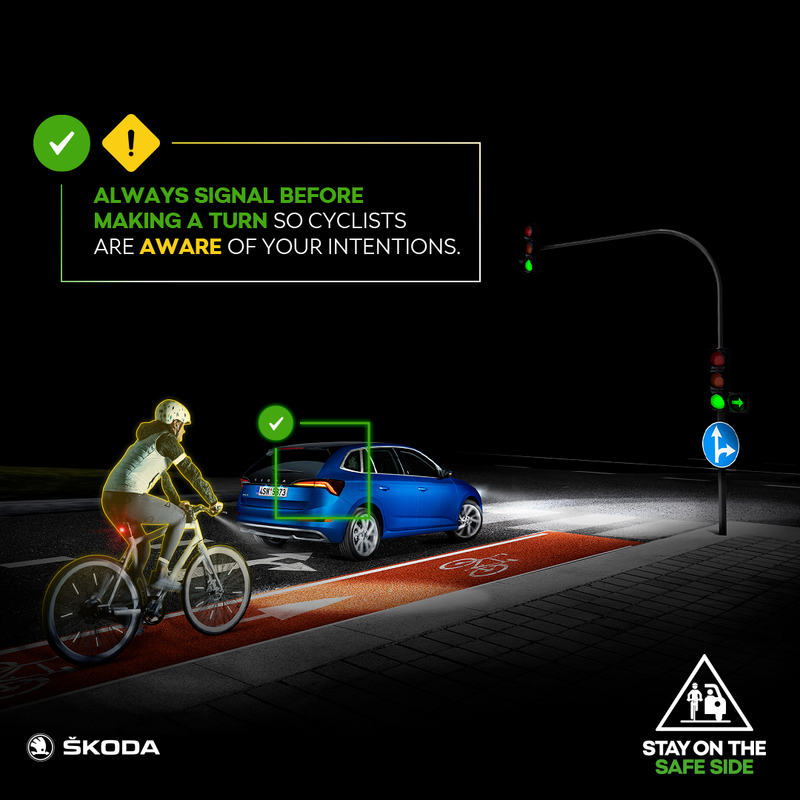 The car intending to turn right draws closer to the cyclist, slows down to their speed and lines behind them to carry out the turning manoeuvre the moment the cyclist is already safely passing through the intersection. Another potential breeding ground for dangerous situations is the case of multiple cars lined up at the red light. Meanwhile, the cyclist undertakes them via the bike lane or the side of the road. The moment the lights change to green, the drivers step on the gas – one or two go straight ahead, not endangering the cyclist at all, but the third makes a right turn in the exact second the cyclist also wishes to pass through the intersection. It’s an obvious right hook again! If the cyclist wants to avoid a collision, her or his best decision would be to match their speed with that of the convoy that got into motion with the green light and to closely observe if any of the cars isn’t signalling a right turn. On the other hand, the drivers need to indicate their turns with sufficient advance. The timely use of blinkers is one of the most vital things for making other road users’ lives easier. 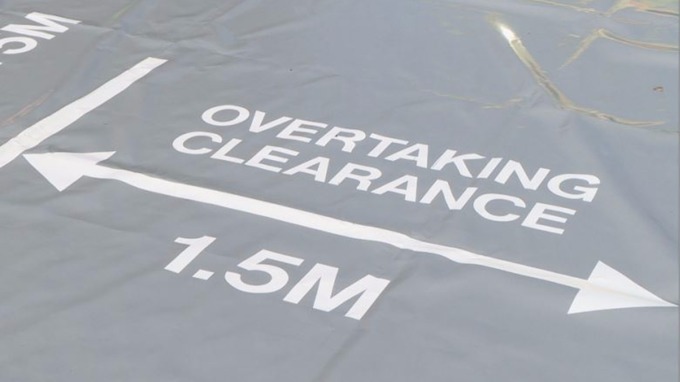 Birmingham Cycle Revolution has paid for a mat used to show people the safe distance to pass cyclists (1.5 metres). Is there a solution that would eliminate the danger of right hooks in today’s state-of-the-art world full of navigations, sensors, and radars, you ask? And it is, indeed. In reality, a number of cars are already equipped with it – we’re talking about blind spot assists. Their basic function is to alert the driver to not to switch lanes when another car is approaching from behind. Advanced sensors, such as those on the new ŠKODA SCALA, can detect even a cyclist if they’re riding at least 16 km/h. As soon as there’s a threat of the car crossing a cyclist’s (or another car’s) path, the warning diodes will go off in the respective rear-view mirror. In case the bicycle is easy to overlook – among other things because the cyclist isn’t wearing reflective elements – the bold flashes work even in worsened visibility. It seems like the future is getting brighter. The drivers should, of course, continue to be vigilant but it looks like the contemporary cars are still steadily shifting us closer towards better safety. Nevertheless, the most essential safety element remains unchanged – us. Take care of yourselves, be considerate, and stay on the safe side!